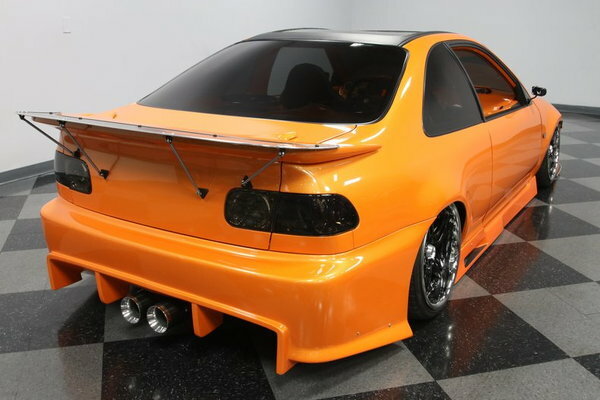 It's hard not to get excited by a show car like this 1995 Honda Civic Custom Tuner. Every inch of this has been custom crafted to be a color-coordinated and premium-packaged exhibition. There's more details, money, and components that went into this one than we can ever list here. But we'll begin to scratch the surface on such an awesome build. 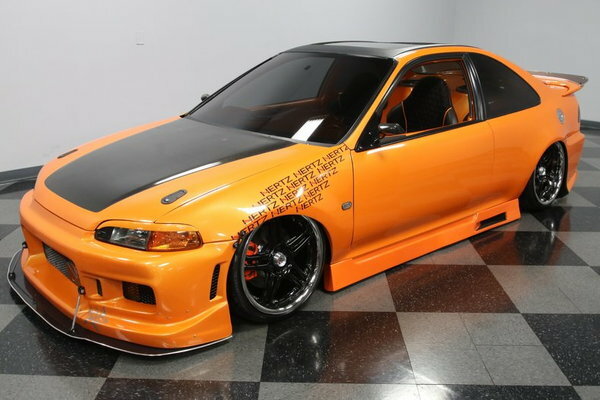 We obviously don't need to tell you there has been work done to this car. The way the Arancio Atlas (Lamborghini Orange) shines with the addition of extra gold flake really makes this look like precious metal. When we can list pages of components that equal $$$$$ thousands invested you really start to understand the level of this deal. 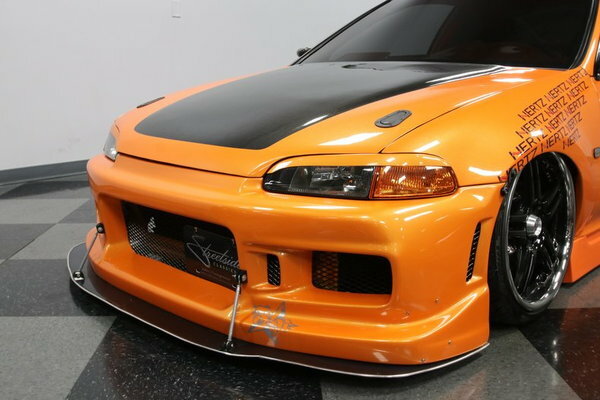 It includes a VIS Racing Tracer front bumper, front bumper extenders, adjustable front wing, front fenders widened two-inches, JDM-style black headlights w/amber markers, ABS composite carbon fiber hood, shaved handles, Sparco locking fuel door, VIS Racing Wave rear bumper diffuser, and VIS Racing Z1 Baxer drag wing. Plus, the roof now has a panoramic view thanks to a custom Lexan insert. Those 18-inch XXR 502-series wheels look terrific no matter when you can see it all, or if part is expertly tucked under the body with the adjustable air strut suspension. You'll see so much more custom work as you look through the photo gallery, and if you give us a call, we'll list it all! Inside is what you see on award-winning custom builds. The full interior has been custom-crafted in fiberglass. It's finished in the same Lamborghini orange as the exterior, and it's designed to fit around you. 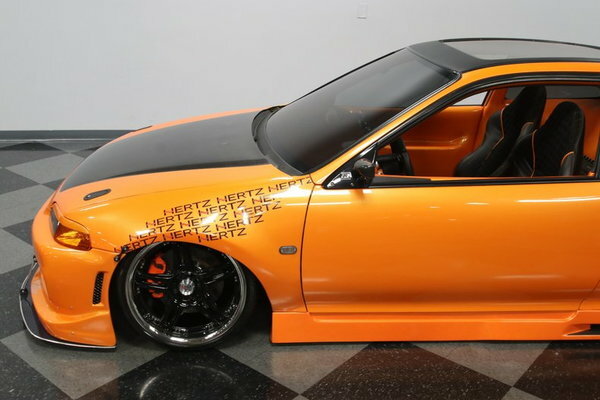 There are five LCD screens, a full Kenwood subwoofer stereo system, Momo Trek II steering wheel, DMS racing seats, Auto Meter Carbon Fiber gauges, and so many more amazing custom additions – so you'll have to call for all the details. This is a show car finished to award-worthy standards. It runs and drives so it can easily be displayed. But there is more work required for those who want to complete the package so that all the race-ready components function to their fullest. 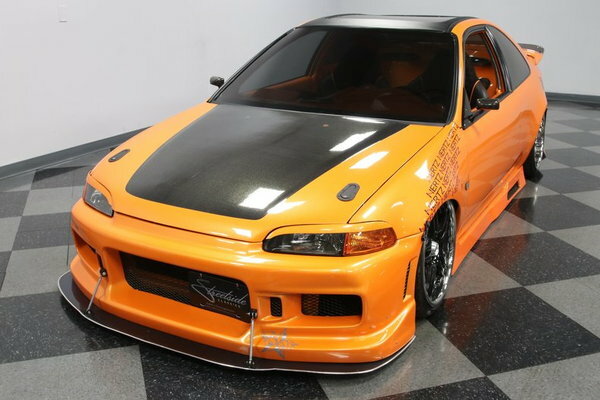 That's why this is priced to leave room in your budget if you want to truly make this a fast-n-furious machine. On a build this amazing, you know the engine bay is ready for showtime, too. 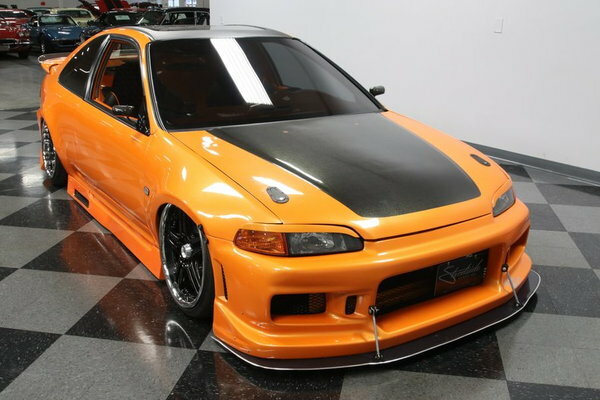 Nothing but metallic orange and chrome catches you eye on this famous VTEC. These motors are known for being terrific at accepting the best modifications, so there's much more going on here than just a stylish setup. It starts with a motor that's bored .20 over with ported & polished heads, 12:1 compression, and a five-angle valve job. The whole setup is balanced and blueprinted, and the ECU has been reprogrammed. The motor has been fortified with JE pistons, Eagle H-rods, upgraded crank, Zex street cam, and an AEM adjustable cam gear. 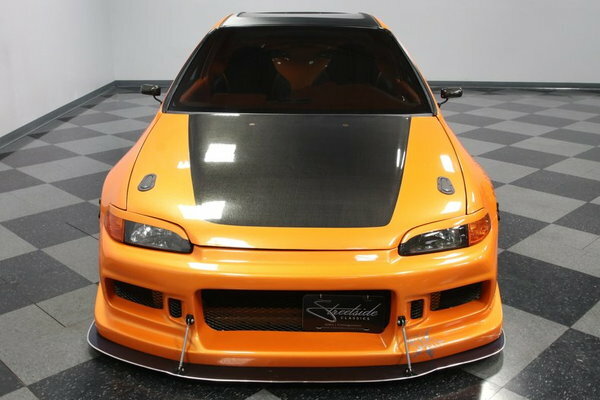 It has JG 72mm bored throttle body, DMS cold air intake, and even provisions for nitrous. You control it all with a five-speed fortified by an ACT 6-puck sprung Stage 3 clutch with ACT 8lbs flywheel. You can take your time looking over all the parts of this outstanding show car. But since you already know what kind of value this is, you also know if you hesitate, this will be gone. Call now!